He was also a big fan of pomegranates and we’d often share one together whenever they were in season and he’d managed to pick one up. When I was in high school we were still taught Classics and I remember having my mind blown the first time I read the Greek myth of Persephone and about her abduction by Hades and subsequent imprisonment in the Underworld, her freedom only granted after Hades had tricked her into eating a pomegranate, thus ensuring that she would be forced to return to him during the winter months all because she’d eaten a tiny, delicious little fruit in the Underworld. I couldn’t believe that a small thing, such as a single fruit, could have such an impact in a story. Although, in retrospect, whenever I taste a perfectly ripe pomegranate I can completely understand why the poor lass couldn’t resist a bite. In saying that, I’ll happily leave Eve to her apples, they’re far too high FODMAP for me, thank you very much. I often think it’s incredible how many of our memories of those who have passed on revolve around sharing food with each other. Perhaps eating together and cooking for each other is the most basic way for a family to show our love for one another. If you’d like to show your family some love, you can’t go wrong with this blood orange cake. 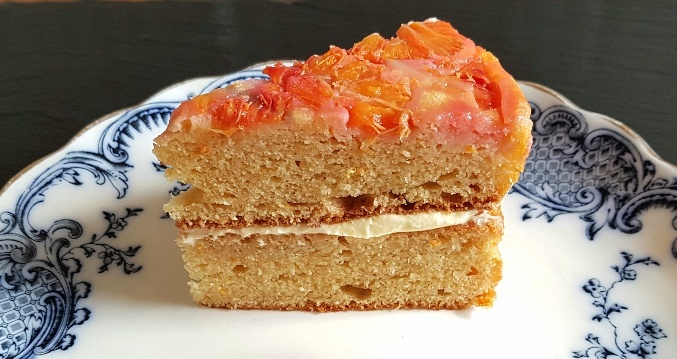 It’s light, fluffy and is infused with the sweet, fruity flavour of orange and it is complemented by a filling of soft whipped buttercream icing. I’d bet both Persephone and Eve wouldn’t be able to resist this cake. Preheat your oven to 180°C/170°C Fan/350°F/Gas Mark 4. Line two 8 inch cake tins with greaseproof paper. Using a zester or a fine grater, take the zest off two of the oranges. Peel the two de-zested oranges and cut the fruit into thin slices before placing the sliced fruit in a thin layer on the bottom of one of the cake tins . Put the orange zest, butter, sugar, vanilla, orange juice and eggs in a large mixing bowl and whisk until combined. Don’t worry if it splits, it doesn’t matter in the slightest. Add the flour, xanthan gum and baking powder and whisk until the mixture is all combined. Divide the cake mixture between the two cake tins , smooth out and bake for 30-35 mins or until a skewer pushed into the middle of them comes out clean. Leave them to cool and in the meantime make the buttercream icing by placing the buttercream ingredients in a jug or bowl and whisking until it is light and fluffy. Once the cakes are cold, take them out of the greaseproof paper and lie the cake without the fruit on your serving plate before spreading the buttercream icing on top. Place the other cake on top, keeping the fruit side on top, and serve. 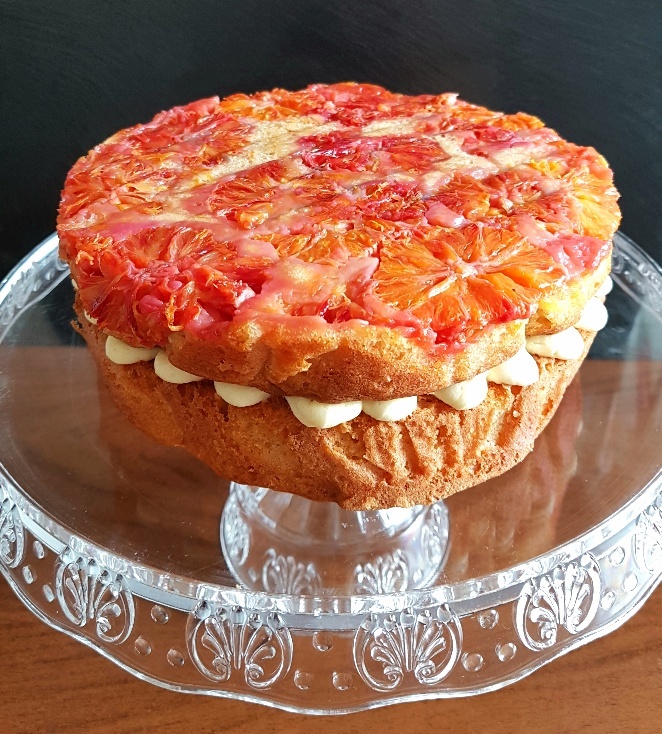 Made this cake with blood oranges off my tree. Simply deliciousl. Family loved it. Came out looking just like the picture and was incredibly moist and not too sweet. Best ever low FODMAP cake I’ve had. Keep the great recipes coming.